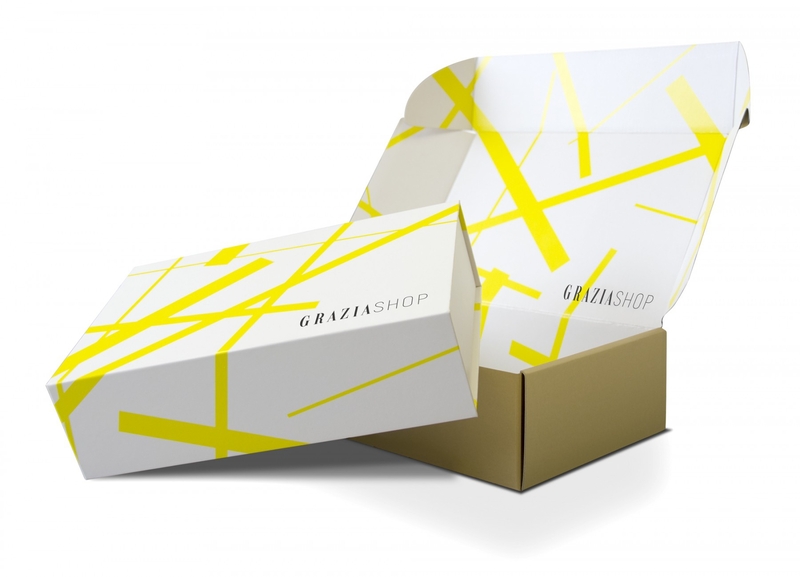 SVIDesign were commissioned by Grazia, one of the world’s most-recognised magazines, to work on the branding and house style for its debut e-commerce platform Graziashop.com. As part of the branding process a new logo was created, using a subtle bespoke san serif font to both compliment the existing Grazia logo and signify the positioning of the store under the umbrella of the global Grazia brand. Taking inspiration from the design of the magazine itself, SVIDesign worked with Grazia’s distinctive colour palette and headline highlighting bars to create a dynamic criss crossing pattern of glossy lemon-yellow stripes on a matt white background. The branding was then applied to a carefully considered suite of packaging, including luxurious magnetic closure boxes and reversible shipping boxes that allow the option of plain cover for security and discretion.